Ourika river splits up the valley dotted with several villages. 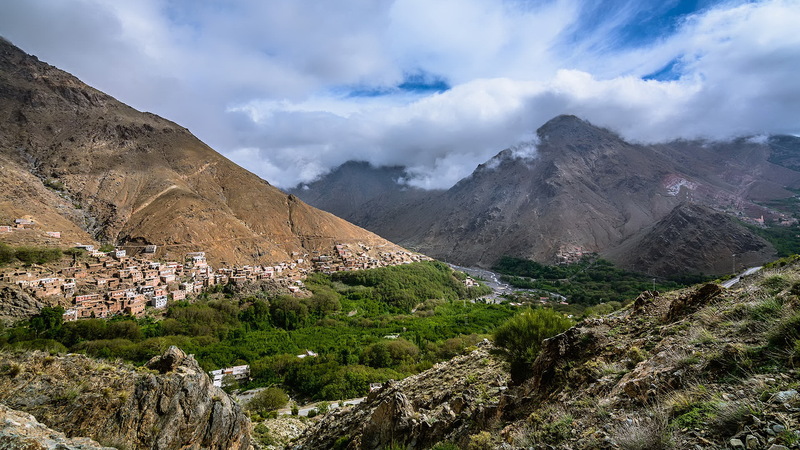 Its location around 65 km from Marrakech makes it a popular destination for both locals and tourists. The famous village of Setti Fadma offers a wide range of cafes and restaurants. It also serves as a great starting point for exploring the mountain terrain and seven waterfalls. We will pick you up around 9 o’clock from your accommodation in Marrakech and head to the Atlas Mountains, after a few minutes through olive tree groves we should get to the gate of the Ourika valley at the village of Tnine Ourika, where a Great Weekly market is set every Monday Once visit the market ( if Monday) we get back on the car to carry on the journey up the Ourika valley till the stunning village of setti fatma which marks the end of the Tarmac road. Once up here we get off and have lunch in a Local restaurant before we set off for 45 minutes walk to visit some of the waterfalls. After the visit of the waterfalls, we then get back to the car and make our journey back to Marrakech to get here around 5 pm with a possibility of visiting a traditional Berber home on the way back.